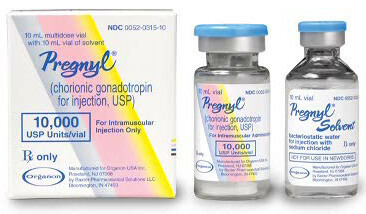 Pregnyl is human chorionic gonadotropin (HCG), a hormone that supports the normal development of an egg in a woman's ovary, and stimulates the release of the egg during ovulation. HCG is used to cause ovulation and to treat infertility in women, and to increase sperm count in men. Human chorionic gonadotropin (HCG) is given as an injection under the skin or into a muscle. If you use this medicine at home, your doctor, nurse, or pharmacist will give you specific instructions on how and where to inject this medicine. Do not self-inject this medicine if you do not fully understand how to give the injection and properly dispose of used needles and syringes. Do not use the medication if it has changed colors or the liquid has any particles in it. Some women using this medicine have developed a condition called ovarian hyperstimulation syndrome (OHSS), especially after the first treatment cycle. OHSS can be a life-threatening condition. 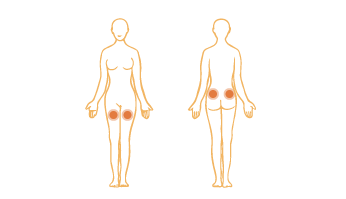 Call your doctor right away if you have any of the following symptoms of OHSS: severe pelvic pain; swelling of the hands or legs; stomach pain and swelling; shortness of breath; weight gain; diarrhea; nausea or vomiting; or urinating less than normal. Follow your doctor's instructions about any special care you may need during your pregnancy.